You've probably heard the news: the LG G5 is now official and is the company's new flagship smartphone. What's special about it is the so-called Modular Design, which allows one to expand the phone's functionality by attaching a different module, all while retaining the removable battery and microSD card slot. Also, that secondary wide-angle camera is a neat addition to the phone's photography package. But there's one more thing that sets the LG G5 apart from many LG phones before it – its full-metal design. Indeed, metal is durable and feels nice to the touch, hence metal-made phones are usually perceived as premium devices. But unbreakable it is not. Despite its metal body, the LG G5 is still vulnerable to scratches and accidental drops. That is why putting it in a protective case might be a good idea. For those of you thinking of getting an LG G5, we've put together some of the best LG G5 cases that have been announced so far. But do keep in mind that these will need to be taken off if you need to attach a module to the handset. It is hard to go wrong with an accessory made by the manufacturer itself. The LG G5 Quick Cover case is lightweight and features a protective cover for the handset's display. But that's not an ordinary cover you're looking at. It is designed to let some of the screen's light pass through, and the UI is built to take advantage of this. When you get a call, for instance, you may pick it up without having to lift the cover. Neat! And when the phone is in stand-by, the Always On Display gives you the time and other basic info. Pricing for the LG G5 Quick Cover case is to be announced. It is named Lifeproof for a reason. This LG G5 case is built to handle much more abuse than a phone should be subjected to. Like being tossed in the snow, for example, or being used in the rain. The Lifeproof Free is not pretty by any means, but adventurers will appreciate its water-resistant properties. 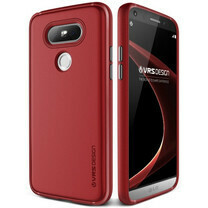 Caseology is a brand known for its inexpensive, yet decent cases. The Wavelength (pictured) is a model made for the LG G5 out of polyurethane and polycarbonate. This two-layer protection is designed to absorb the energy from accidental bumps and to resist light scratches. Plus, the case's texture provides good grip. The Skyfall, on the other hand, is a transparent LG G5 case with clear back to show off the phone's metal body. Spigen - one of the well-known names when it comes to cases - has already put three LG G5 cases on Amazon. 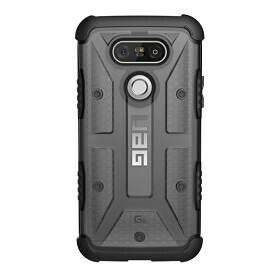 The toughest among them is the Rugged Armor case (pictured), which is made of flexible polyurethane to absorb impact energy. If you need something lighter, there's the Spigen Thin Fit made of thin polycarbonate. And if a transparent LG G5 case is what you're looking for, check out the Spigen Ultra Hybrid. Its soft bumper protects against accidental drops, while the hard polycarbonate back leaves the G5's metal back in plain sight. The Trident Aegis Pro (pictured) is meant to be highly protective without being obnoxiously bulky. It guards the phone from all sides with its two-layer protection, while flaps protects ports and jacks against dust ingress. The Trident Krios is another LG G5 case worth checking out. It is lighter, thinner, and transparent, showing off the natural beauty of the G5's metal body. Speck is another accessory maker you might have heard of. Its Candyshell case for the G5 is thin and light, but designed to take on more beating one would expect. In fact, the case is military certified for resistance against drops. For those who aren't into black, there's a clear version of the Speck Candyshell. The Obliq Skyline Advance (pictured) is the only model on the list to feature a kickstand. It is built to be tough, with a hard shell on the outside and a soft, impact-absorbing layer on the inside. And it comes in several pastel colors! In addition to this model, Obliq is offering the Flex Pro, which is built to deliver similar level of protection, but is wholly made of soft polyurethane. VRS Design has a trio of LG G5 cases, and the Single Fit (pictured) is an attractive, light, colorful model. Alternatively, VRS Design is offering its Crystal Bumper case, which is light and transparent, providing adequate protection without obscuring the handset's looks. The problem with most of the cases is that they look cool and premium in pictures. But when you order it then you found out that they are not that premium looking and made your phone feel pretty cheap. Whats the point of making the phone with metal(G5) or glass(S7), when you are going to cover it anyway? Phones look pretty great in naked. Buy Spigen or Caseology and you know it will look and feel premium. I agree phones look good naked but the G5 isn't the best looking phone tho. I'm rocking that Spigen ultra hybrid tech(It's clear) on my 6s plus looks great and feels great, best case I've ever owned. It does look somewhat better with a case. Takes care of the camera hump nicely. To me it looks like a Putting a Lipstick on a Pig. Me. But I want to have a capacitive buttons module bcoz I don't like onscreen buttons. Rather than getting G5, u must consider that LG has a good impression about its buggy software . So must wait for about 2-3weeks untill someone gives a good review on it. Of course I will wait for the reviews. I am not a kid and my hormones are not boiling high to jump to grab one. the red one actually makes the phone looks good for once. It looks so good in that rugged armor. I guess the very fact you need a "Protective Case " for a Metal Phone means your definition of "Build Quality" Is in Fact Inaccurate! Lamborghini's and Ferrari's aren't made of These So Called "Premium Materials" but I guess they would be "Premium" to those who don't know what "Premium" is. I wish you writers understand the difference. Noah shouldn't have NEVER coined that phrase..Bad misconception. As for this Phone.. The Cases and Case Manufacture have a Golden Opportunity to take this phone to another level by adding Modular Features into their cases for extra battery life, Solar charger,Stereo/Surround Sound Speakers, Other Camera access, and others they can think of to tunr this phone into a Monster Beast. But Again, it will make or break will the imagination and on board manufacturers( or lack there of)... Nice phone though wish they kept the back volume buttons tho. At least the case helps hide how ugly the back of the phone is. Haters still hating I see. So alot of these cases are useless if you want to use the B and O amp module?